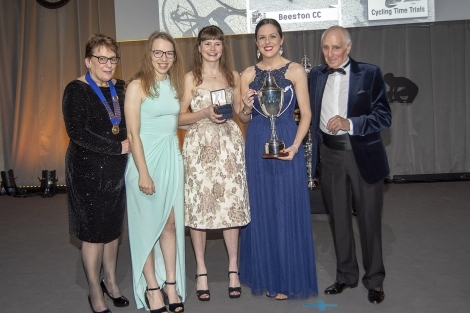 On Saturday the 19th of January 2019 Laura Owler Yasmin Marks and Emily Kate Walton received their National Hillclimb Team titles and medals at the National CTT Champions' Awards. They changed out of the lycra and into the sparkle as they enjoyed a fantastic evening with family and friends including fellow queen bee Alice MacArthur and all the other champions from across the country. The Trophy was presented by CTT Chair Sheila Hardy and presenter Alf Engers, multiple national champion and the first man under 50 minutes for a “25”. The CTT Champions Night was held at Heythrop Park in Oxfordshire where they celebrated all the champions and their achievements for 2018. This is a major honour for our club, our members and sponsors and the Queen Bees are thankful for your continued support. Nothing ever stands still and the full squad is already planning and looking forward to another great season ahead.